In February 2017 in my hometown of New York City, I had the good fortune to attend and participate in the fifth annual Rieslingfeier, one of the few events of its type dedicated to German (and, as of this year, Austrian) wine collectors. Taking inspiration from Burgundy’s wine festival La Paulée, Rieslingfeier invites a high-profile group of about a dozen winemakers and estate owners to New York each year to meet and taste with customers in multiple venues around the city. These include an official walk-around tasting, assorted private dinners and bar-hangs, and a series of moderated seminars, capped by a gala BYOB dinner on the final night. The pourers working the event are an impressive crew of A-list sommeliers, mostly based in New York, who donate their time and service in exchange for the opportunity to taste hundreds of otherwise hard-to-find mature German and Austrian Rieslings. As far as the trade is concerned, the somms are the “real” audience here, for they are the wine world’s tastemakers who, inspired by the great wines they experience and winemakers they meet, presumably go forth afterward and preach the Riesling gospel. Two of the top sommeliers in New York led the opening seminar at Rieslingfeier this year: Eduardo Porto Carreiro, formerly of Untitled at the Whitney (now working in Atlanta), and Raj Vaidya, the head sommelier at Daniel. The seminar was titled “Speaking German—German Wines in the Contemporary Landscape” and was described in the Rieslingfeier website as “an industry-only tasting/discussion focusing on the challenges, and rewards, of German wines, with a focus on restaurant and retail practices.” The winemaker panelists were Cornelius Dönnhoff, Johannes Leitz, and Caroline Diel. The personnel involved were all astonishingly talented and articulate leaders in their field. I looked forward to hearing the unique perspective the winemakers could offer about the “state of the state” of selling German wine in the US, specifically its challenges—which have been much on my mind lately. Raj and Eduardo are funny, clever guys who could have ably steered that discussion through its potentially treacherous waters, and also contributed their war stories and successes from New York’s most high-profile dining rooms. The trade-only format meant we could all let down our guard and dig into the problems this category faces and hopefully voice some creative solutions. If ever there was a brain trust convened for the task, this was it. Meanwhile, the hijacking of that seminar by the perennial sweet/dry debate missed a huge opportunity. The larger question—why isn’t German wine overall selling like it should?—is the launching point for a much more interesting discussion which includes numerous interconnected social and economic issues which have never been well spelled out, as far as my readings have taken me. I will do so here, as best I can. Let’s first go back to the sommeliers. Their knowledge and enthusiasm are not the problem. Scratch a NYC somm and you will invariably find a German Riesling lover. Almost every one of them posts Instagram photos of rare old bottles from the Rhine and Mosel regions that they’ve recently enjoyed. They track current vintages too, opining for instance about the broad 2011 wines versus the tense, nervy 2013s. They do their best to learn the ever-shifting nomenclature of German labels. Everyone in town knows what a trocken wine is, and most understand why they have to pay more for a GG. They know the famous estates, they recognize at least some of the famous vineyards, they can usually “blind” a Rhine Riesling from a Mosel one, and the true geeks get a perverse kick out of Scheurebe. So, although there is always more to learn and regular sharpening of pencils required, knowledge of the category and love for it are not problems for a majority of the buyers, namely, sommeliers and fine wine retailers. The problems start at the point of sale. What happens to a great Riesling Spätlese or GG once it is added to the opening list of a hot new restaurant? More often than not, it sits there. The stumbling block is not getting the wine on the list; it’s selling through it. While Rieslings by-the-glass or under the “sweet spot” of $50–$60 tend to move with acceptable efficiency, the higher-priced wines tend to languish in the cellar for months, sometimes even years. In a New York restaurant, that’s a disaster. Rents and operating costs, especially in the new increased minimum-wage environment, are ridiculously high in the city, and most places break even or even lose money in slower weeks on their food. The wine list almost always generates the income that sustains the entire operation. A wine that doesn’t move well becomes a serious financial liability. That has several ill effects. It shrinks the space allocated to German wines on most lists, of course. A page or two or three of Chardonnays from France and California is very common, but a half page or more of German wines is rare. Small selections ensure that German wine remains a niche category. It gets lost on the list, shunted off to the “Other” page, lumped in with Austria and Alsace or “Aromatic Whites” or, much worse, “Sweet Wines.” It also makes it easy for customers—or inexperienced servers—to skip. Why struggle with the tortuous explanations and unpronounceable names of German wine when a page later you can rest easy with the Sauvignon Blancs? Another side effect of slow-moving inventory is price reduction. What does a wine director do when she can’t move an item? She will either special it out by the glass or lower the price. The latter choice, far more common, keeps German wine prices artificially low, and pushes the wines deeper into the ghetto. Servers see less monetary reward on their average check and quickly learn to push other wines. Customers take the wines less seriously than the hallowed names of Burgundy and Napa whose higher list prices seem to indicate higher quality. Smart wine buyers, ever vigilant, hunt for bargains and closeouts and gray-market goods—because they know if they wait long enough, they can find deals on last year’s vintage. They’re not wrong. In these ways, the downward pressure on pricing self-perpetuates. Of course, slow-moving inventory wouldn’t matter as much if the wines appreciated in value with age. Some restaurants with deep pockets in the US pride themselves on their deep libraries of older wines, bottles that patient and astute owners have amassed over many years that they can resell later at remunerative prices. But somehow German Riesling has sidestepped that opportunity. Indeed, German Riesling is one of the few fine wines whose value often diminishes or stagnates as it gets older (compared to Bordeaux which ramps upward seemingly without limit). A cursory look on Wine Searcher and other Internet sites reveals many compelling bargains for older German Riesling available for purchase from private cellars. This is ironic, because German Riesling is, without doubt, the most cellar-worthy white table wine in the world; nothing comes close to its capacity for development with age. It should be a good investment for profitable resale; yet, once again, its perception as a niche, a curiosity, a wine for devoted fans only, prevents it from achieving mainstream collector’s status. The exception? High-priced, extremely rare BAs and TBAs. But those aren’t table wines and they don’t typically end up on restaurant wine lists. They end up at Thanksgiving dinner or at events like Rieslingfeier. In summary, slow turnover on-premise leads to limited demand, which leads to decreased prices, which leads to low perception of value, which leads to…bargains? But isn’t that a good thing for the consumer? One of the selling points of German wine for decades now has been their tremendous value, what wine professionals call QPR or Quality-Price Ratio. Every promotional piece written in a newspaper or magazine seems to inform the reader brightly—even conspiratorially—that German wine offers some of the best bang for the buck in the world. That QPR strategy has worked to boost fortunes for Prosecco and Australian Shiraz and a host of other categories; why not German Riesling? One interesting answer posited by Jancis Robinson is that Riesling might just be too “interesting” to capture a general audience. In a blog entry on JancisRobinson.com, dated September 30, 2014, she wrote, “…more and more I realize that Riesling just has too strong a personality to appeal to enough consumers to gain global traction. The problem with Riesling is that, unlike Chardonnay and Pinot Grigio, it has a very powerful flavor…. which some people are bound to dislike.” That’s a heretical opinion for a celebrated wine authority to express—but I must say, I rather agree. It strikes at a paradox about capitalism in general that quality doesn’t necessarily sell, but ease of use frequently does. Why do Americans choose fast food and chain restaurants, clearly inferior in their food quality, presentation, and ambiance, to food from independent outlets? Because it’s frictionless: the comforting sameness of the food, presented cheaply and portably with minimal human interaction, attracts customers who don’t always want the dog-and-pony show of a traditional restaurant. Massive national advertising targeted to kids and families reinforces return visits, perpetuating sales. Riesling, of course, offers none of these things; it’s poorly advertised (the Germans have little knack for it), bottled in those strange-looking flute-shaped bottles, widely varying in style, confusingly labeled, and worst of all, 90 percent written in German. Who wants to risk it? The labeling, of course, is a disaster. One of my colleagues in wine wholesale occasionally asks me to recommend “one of those Hocken Bocken Trockenbauers.” German is not an easy language for Americans. The words sound comical to our ears. Some of my favorite vineyard names include Assmannshausen (a gay bar in Berlin? ), Winkelsprung (the men’s room in the back of the bar), and Schlangengraben (what goes on back there?). The hard, unforgiving term “Grosses Gewächs” (with an umlaut, no less) will never enjoy the hushed tones of respect accorded to the mellifluous sounding grand cru. Furthermore, it’s not an exact synonym, but a more complex concept. It’s not a vineyard classification but a wine from an approved grape in an approved vineyard which must be vinified dry (under 10 grams of sugar per liter) but from minimally ripe grapes, unless they chaptalize it, and so on. Try explaining to the average customer—or a trained sommelier, for that matter!—that GG is not even a legally approved term, but emanates from a “shadow system” of VDP terms and labels which seem to get altered every few years. What’s a VDP again? I’ll have a Sancerre, thanks. If this article is starting to sound relentlessly negative, readers should be aware that I am actually practicing considerable restraint. The list of challenges to German Riesling’s popularity goes on and on. The 1971 Wine Law is a bogeyman to be sure. Its expansion of vineyards based on political exigencies, its shift of focus from terroir toward ripeness, and its elevation of the bulk bottlers and diminishment of the hard-working growers has all been chewed over by the light of many campfires. I could cite the ridiculous convention in the international press of lionizing only the noble sweet wines with scores of 97–100 points while the Kabinetts and Spätlesen—arguably Germany’s greatest contributions to the world of wine because they have proven inimitable anywhere else on earth—are treated as second-class citizens. The Liebfraumilch phenomenon that popularized cheap, sugared wines in the 1970s and 1980s still pollutes the waters. So does the stigma of Germany’s horrific role in World War II, a topic that absolutely no one wants to talk about. It’s decades later and two generations past, but, in New York, I can tell you the jokes still come cheap and easy about marketing Riesling for its “genetic superiority” or recommending German wines for Passover. It’s all genuinely problematic and worth discussing at next year’s Rieslingfeier. And yet…after many years of thinking about it, I’ve realized that a huge problem remains ignored, in spite of being glaringly obvious. I believe one of the biggest hurdles to expanding the sales of German Riesling and reclaiming some of the preeminent role it once held on the wine lists of New York is simply this: the city lacks one single great German restaurant. One hundred percent French or Italian lists are commonplace in New York, sometimes running to hundreds of selections. Tapas restaurants feature the wines of Spain. Most sushi bars are also sake bars. By contrast, there are no German establishments with anything more than a cursory three whites and three reds. In practice, those places are mostly Bavarian with an emphasis on beer, sausages, and pretzels, not haute cuisine. They do not provide a showcase for wine. Great German wines can be shoehorned into non-German lists, of course, as they regularly are in many of New York’s best restaurants. But they can never dominate those lists. That could only happen organically at a temple of German gastronomy where customers accept the logic of regional pairings and aren’t surprised to see an all-German or mostly German selection. The problem is no such temples currently exist. The Top 10 New York restaurants in the 2017 Zagat’s guide are all either French or New American, with one sushi restaurant bringing up the rear at #10. (Peter Luger is at #6 and has German origins, but most diners today would agree it is a quintessentially American steakhouse). The New York Times list from 2016 is far more eclectic, perhaps with a light aroma of self-righteousness about its cutting-edge choices, like Nordic cuisine, an Asian noodle joint, and a Peruvian eatery in Brooklyn. Again, however, Germans need not apply. There is one notable exception that opened recently. The excellent Günter Seeger NY had a rocky launch last spring but by the end of the year was on The New York Times Top 10 list and awarded a Michelin star as well. Chef Seeger, an auteur of the old school who orchestrates every detail of the dining experience at his establishment, is German-born and formally trained in Switzerland. He knows German wine expertly and insists on populating half of his list with them, which is a fantastic commitment deserving of recognition. However, he does not identify as a German chef. He is self-created and defiant of categorization. There are Asian and pan-European flourishes throughout his food (truffles, bottarga, uni) and a strict reliance on the daily greenmarket for his ingredients. So the closest thing New York has to a great German restaurant isn’t really German. It’s Seegerian. Many assume that the lack of top German restaurants in America reflects a dearth of them in the national homeland, but this is inaccurate. Taking Michelin stars in Europe as an indicator, it may surprise readers that ten restaurants in Germany were awarded three stars in 2016, while Spain, the preeminent hotbed of gastronomy in recent times, had nine. Great Britain had merely four. Overall, there were 292 Michelin-starred restaurants in Germany, again beating both England and Spain by a wide margin. Germany even stood tall beside France, the winner (no bias) with its 616 starred establishments. In my experience, high-end German food is elegantly presented, primarily ingredient-driven, and lighter than is generally assumed. Modern chefs there have embraced the local/seasonal ethos and enjoy an abundance of game, freshwater fish, organic vegetables, herbs, and hundreds of varieties of white and dark breads (which, anecdotally at least, have inspired French boulangers for generations). In other words, the “serious” cuisine of Germany can compete in the international arena, but its emphasis on fresh ingredients falls right in line with current American food trends. The indigenous wines are perfect for it, and hugely divergent in style so as to complement a varied menu of appetizers, pastas, fish, meats, salads, and (rare for many wine cultures) cheeses and desserts. Furthermore, the robust economies of both the US and Germany should allow for confident investment and patronage from both sides of the Atlantic. The niche is wide open and the appetite of New Yorkers for new restaurant concepts is seemingly inexhaustible. 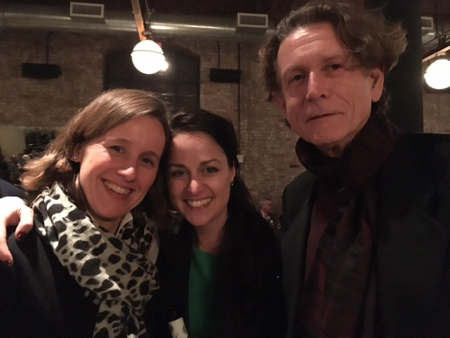 Photo by Evan Spingarn of Katharina Prüm, Sabra Lewis, and Günter Seeger at Rieslingfeier 2016. Evan P. Spingarn has worked in wine for 25 years as an educator, consultant, writer, retailer, and wholesaler. He is currently the senior salesperson and German brand manager for David Bowler Wine, a fine wine importer and distributor in New York. Thanks for the article Evan. I was one of the Somms at Rieslingfeier this year (the third year I’ve done it) and I must say, your article hits somewhat close to home for me as I went through point by point. I wasn’t able to be at Raj’s seminar, sorry I missed it. My quick thoughts are as follows. 1. Yes, pretty much bleed Riesling. A third of my personal cellar is Riesling. 2. If you come into the wine room at Craigie on Main currently, fully a third of it is taken up by Riesling. 4. My staff thinks Riesling goes with dinner. 5. We lie or embellish and lump a lot of wines onto the dry page to sell them. Producers like Lauer and J Haart are tagged dry. We’ll acknowledge the RS when selling them, but if it drinks dry to us, it is dry to us. 6. We, too, struggle to sell Riesling that is sweet. However, we don’t have a big collection of older wines. Spatlesen back to 04, Auslesen back to 02 w a few oddballs from time to time. 7. I get far more wine back from tables that is not Riesling (because of guest satisfaction issues). Burgundy w stem inclusion, 08 red Burgundy, ‘Natural’ wines. People like Pinot Noir till they realize some of it is sour. People like the idea of natural wines it smells like a horse that’s been rolling in manure. However, a little RS in your German Riesling isn’t a problem. 8. Pricing. For the consumers, the lack of appreciation (both meanings) is amazing. We currently have 02 JJ Christoffel Würzgarten Auslese for under $100. Try getting 02 village Burgundy under $100. And if you know a place, please tell me so I can go drink it all. Similarly, we don’t mis-price Riesling like we do other categories. Maybe it’s just Boston, but we give Champagne away. You want Prevost. Come to Craigie to drink it. It’s $130. If I made it $185 I’d just stare at it all year. Do I think it’s worth $185. Yes. Do our clients. No. Ditto Alsace. However, we price GG Riesling in the over-under $110 pricepoint and it moves. It doesn’t fly, but it definitely moves. 9. A Great German Restaurant. We, at Craigie, aren’t German at all. However, German and Austrian wine go great with our food so we sell a good amount of them. I would say this: You don’t need a great German restaurant, you need a list with a great German presence. Take Trestle on Tenth in Chelsea for example, a gem of a two page wine list. If you are going to buy wine with dinner, would that list encourage you to skip wine altogether if you aren’t a member of the cognoscenti. Probably. However, do you think people skip it? I don’t. To your comment about profitability, you are largely correct, however, that’s the problem in restaurants with everything. I hate seeing people slug cocktails at dinner until I remember we run 11% cost on most of them and that pays for a lot of things, most specifically inflated benefits for employees, and a liveable wage for cooks, plus a host of other things. Thanks for your reply to Evan, Carl. Craigie on Main is a great example of an American restaurant that focuses on German wines, and I’ve always enjoyed the food and wine at Trestle on Tenth. Of course, Peter Lauer is now in the VDP and makes several GGs from choice vineyards—Kupp, Saarfeilser, and Schonfels. Thanks for an interesting article Evan. One could think outside the box when it comes to pairings: In Erbach in the Rheingau, Achim von Oetinger has leased his Gutausschank to an Italian family who makes the most wonderful pasta. His dry estate Riesling pairs perfectly with the pasta. In Trier, my favorite joint for food and wine is Yong Yong, where I help do the wine list. It’s Southeast Asian cuisine and all Mosel wine (including feinherb and residually sweet Kabinett wines) from producers such as Weiser-Künstler, Willi Schaefer, and Schloss Lieser. Yong Yong sounds like my dream restaurant, Lars! On my next swing through the Saar, I’m going to trick you into taking me there! Thanks for your many insights Evan. Too bad they make for somewhat depressing reading, but I have unfortunately no reason to doubt your expertise in these areas, and my own experience as well as my conversations with other wine-selling professions confirms many of the challenges you’ve highlighted. Here, however, are a few matters I would question or about which I have something to add that I hope is useful. On the seemingly endless re-hashing of sweetness as an issue: I can assure you that residual sugar (often as Public Enemy #1) has been a fixture, indeed a fixation, of German trade public relations, German gastronomic journalism, and even discussions of German wine in that country’s popular press (e.g. Der Spiegel or Die Zeit) since the 1960s, and especially since the advent of the so-called “dry wave” of the 1980s (in which the Charta movement that you mention certainly played a role). This should be appreciated in the context of a phobia concerning sugar among German wine professionals and consumers that goes back to the late 19th century demonizing of chapitalization (under the heading of ferreting-out wine fraud) a demonization that gave birth to what is today the VDP. If you examine the popular German press of the 1960s and 1970s on the subject of German wine, you’ll find that matters of chaptalization and vinous sweetness are thoroughly run-together under the rubric of sugar. The VDP – its name notwithstanding – has long since made peace with chaptalization. Residual sugar has become all the more suspect and often takes the brunt of abuse. This background helps explain why you are not soon if ever going to get German wine growers or German wine and gastronomical journalists to stop emphasizing residual sugar, which makes it all the harder to keep that topic from dominating discussion abroad as well. If German Kabinetts and Spätlesen hadn’t continued to creep ever-higher in residual sugar throughout the ’70s, ’80s, ’90s and ’00s we would have a wider range of German Rieslings to choose from whose sweetness is integral to their character but doesn’t have to be addressed as a warning to potential purchasers. I have often cited and lauded the numerous growers on the Saar who market in the manner that Carl says works for him: placing both analytically dry Rieslings and Rieslings of discreet or hidden (legally halbtrocken) sweetness under one and the same heading (“dry” … or sometimes “dry-tasting”) on their price lists and scrupulously eliminating “trocken” (not to mention “halbtrocken”) from the labels of wines that qualify for those technical descriptors. But then, outside of the Saar, there are dishearteningly few German Riesling growers whose portfolios consist to any significant degree of wines ranging between ten and thirty grams of residual sugar. As I have often had occasion to complain: German Riesling has become stylistically schizoid, with the typical VDP Riesling estate, to the extent that they bottle any non-trocken Riesling, doing so only beginning at 30, 40, 50 – or, if they only bottle residually sweet Riesling of the “prestige” category Spätlese – perhaps only at 70 or 80 grams of residual sugar! If there were more German growers concerned to showcase what virtually only German Riesling can achieve – notably including low-alcohol yet complete analytically dry wines as well as wines of efficacious but hidden sweetness – then German Riesling could be more effectively and widely integrated into a context that offers opportunities for introducing diners to the genre, namely pairing as glass pours with prix fixe menus. The VDP has in fact gone out of its way to marginalize or even to disrespect these sorts of wine that “only we [Germans]” as opposed to “we [Germans] too” can render. The imbalance between food and wine profitability is a real obstacle to wine appreciation. And viewed from at least one perspective, it’s an embarrassment and a shame. (Viz. “The refuge of a restaurateur who can’t get a handle on his or her food costs is to grossly overcharge innocent diners for beverages.”) Still, having been a restaurateur myself – albeit long, long ago – I understand how that imbalance arises and how hard it is to redress, so I think we have to with regret set that issue to one side, recognizing that it disadvantages all wines equally, and that the cache of a given wine category and its ex-cellar pricing are going to be the factors that are critical in determining how much a diner is willing to pay. Regarding stagnant value, that’s not peculiar to German Riesling. I can buy classic Bordeaux wines from the 1970s through the early 1990s for a fraction of what the same crus have been selling for in recent years. And precisely the success of the VDP in marketing site-specific dry Rieslings to consumers prepared to pay a premium has meant that most Grosses Gewächs bottlings begin life at a much higher inflation-adjusted price than did a dry wine from the same site and grower on a price list of the ’80s or ’90s. (Though not, thankfully, at several times the price as has been the case in Bordeaux.) That success, significantly, has been domestically driven. As German Riesling has gained cache among German wine drinkers – who are among the most affluent of any consumers in the world – this has translated into ever-higher ex-cellar prices. The VDP, from its pointy-headed “pyramidic” perspective, has encouraged scarcity among GGs and discouraged the bottling of less-expensive vineyard-specific wines, all of which is unhelpful from the perspective of an American merchant and restaurateur trying to awaken interest in German Riesling in a realm of three-tier pricing, high restaurant mark-ups, and consumers who are both price- and terroir-conscious. Frictionless sameness – which you adeptly characterize – is always going to dominate consumers’ choices, and by no means only in the US. So I’m tempted to set that issue aside as well. I’m old enough to remember a time when a major share of the frictionless same that was chosen by the overwhelming majority of American wine drinkers consisted of slightly-sweet and generally insipid German white wine. But obviously it would only inhibit the cause of quality German Riesling to revert to that situation; and in any case, those of us who market or write about German Riesling are not able to bring about categorical change in what constitutes the frictionless same of a given era. We can only influence at the margins, and specifically among consumers well-off and adventurous enough to explore a wide range of wines at home and when dining-out. What I think any veteran of the wine or restaurant trade can gratefully report from experience is that the share of American consumers who prefer frictionless sameness in food and drink has at least been whittled-down over the past half century and the degree of adventurousness increased along with affluence. Your comments about labeling are certainly spot-on and I would merely hammer-home more explicitly what trouble German wine growers and their marketing advisors continue to create for themselves. The circa 1900 list to which Lars refers above seems to mark a period of transition to the nomenclature of German Riesling that after the Second World War became standard, namely the identification of both village and vineyard. But during the late 19th century high point of German Riesling prestige (and the first rise of Mosel Riesling to international attention) the best German Rieslings were marketed solely under the name of the vineyard or of the village. (The latter not automatically less prestigious than the former, VDP please note!) Granted, most of us share affection for Riesling as a grape and recognize that US wine drinkers especially want to know about grape varieties. So we would probably prefer to list and promote a “Hermannshöhle Riesling” rather than merely “Hermannshöhle.” But “Niederhäuser Hermannshöhle Riesling Grosses Gewächs,” let alone “Niederhäuser Hermannshöhle Riesling VDP.GROSSES GEWÄCHS” with a copyright symbol, as the VDP would now have it?! (Mind you, the faux-Burgundian VDP affectation of removing reference to villages if the wines are from “Grossen Lagen” is foolish given how many Schlossbergs, Herrenbergs &c. there are. But on a restaurant list, or in commending a bottle for the consumer’s attention, its grower and the region are likely going to be mentioned, and that serves for sufficient disambiguation.) Incidentally, this shooting of one’s self in the foot isn’t confined to the Germans. I still consider “Bründlmayer Riesling Heiligenstein” an entirely adequate, complete wine description – to which might helpfully be added in parenthesis or the right-hand margin on a wine list “Kamptal, Austria.” But the Austrian authorities and Austrian Traditionsweingüter collectively would now have us write “Bründlmayer Riesling Zöbinger Riede Heiligenstein Erste Lage-ÖTW Kamptal DAC-Reserve.” If only this were merely intended as the joke it reads like. I would caution – as I did at the Rieslingfeier seminar we attended – against conflating intimidation-by-must weight or by residual sugar, or lack of proper respect for Kabinett or Spätlese (both widespread journalistic habits that I, too, condemn) with recognition that the most successful BAs and TBAs from top Riesling sites are at once amazing creations and natural wonders worthy of their elevated prices and (if one must engage in that practice) their scores, which alone explains why if I “rate” a Riesling 97-100 points, probably half the time it’s a BA or TBA. Regarding “German restaurants,” I think there might be some confusion. Those restaurants in Germany that have earned Michelin stars and contributed to the domestic prestige of their country’s Rieslings are generally no less internationally inspired and no less grounded in French tradition than are their non-nationally-designated counterparts in other countries. To be sure, focus on regional ingredients or the refinement of regionally-typical dishes play a role in many of Germany’s most prestigious and wine-friendly restaurants. But to call any of these establishments “German restaurants” in the sense that an Italian, Spanish or Japanese restaurant would be understood to specialize in cuisine of a specific tradition (including as regards presentation and menu-organization) would be misleading. There certainly are in Germany (and occasionally in the US) “German restaurants” in that ethnic sense, i.e. ones that serve only dishes with roots in German tradition; but these are seldom restaurants that have acquired Michelin stars or done much for the cause of German Riesling. It might well be, however, that sales of German Riesling would benefit from there being more US restaurants whose owners, chefs or sommeliers were German. Even twenty years ago I would have doubted that, but consciousness of and enthusiasm for German Riesling has grown so significantly domestically that one can nowadays expect a German-born, German-trained chef or sommelier to be keen on promoting his or her country’s wines. Wow! Thanks for your comment, David. You make so many good points. In “A Tasting of 2015 Mosel Riesling Kabinett,” many of the wines from the best-known estates had around 60 or more grams of sugar per liter. The top Kabinett for Gault&Millau Weinguide Deutschland 2017 is the excellent 2015 (Saarburger) Rausch Kabinett VDP.GROSSE LAGE from Zilliken. But it has nearly 70 grams of sugar. It should be noted that this German wine guide has no problem with sweetness, though the publisher and editor Joel Payne would like to see the trend continue towards residually sweet “classic” Kabinett with lightness and lower amounts of residual sugar. Many producers are eschewing the -er ending on the village, vineyard, and vintage. I know it’s trendy among VDP members and nonmembers to copy Burgundy and leave off the village name, but only certain vineyards had historically no village name attached, like Bockstein, Scharzhofberg, Ohligsberg, or Euchariusberg. This is different from Zilliken changing “Saarburger Rausch” to merely “Rausch” and then putting “Saarburg Rausch” on the back label. In the 1890s, the wines from this main south-facing hillside in Saarburg were called simply “Saarburger” (from Saarburg). But many of the best vineyard sites—like Ayler Kupp, Eitelsbacher Karthäuserhofberg, Dhroner Hofberg, Bernkasteler Doctor, or Trarbacher Schlossberg—included the village or town name in the 1890s, with an adjectival -er ending, indicating the possessive case. Evan Springarn’s recent article on the difficulties of selling German Rieslings in New York restaurants prompts me to add some further observations from nearly forty years as a (part-time) wine merchant in Liverpool, where I had both private-customer and restaurant trade. Evan identifies many of the well-known hurdles, but there is one aspect of the debate which I would like to highlight in the following remarks (which are intended to echo and amplify David Schildknecht’s detailed response), namely the question of flavour. In the discussion of German Rieslings Jancis Robinson’s observation that Riesling has ‘a strong personality’ and that it contains ‘a powerful flavour’ has not been universally accepted. Nevertheless, she has a point. The problem lies in her choice of words: substitute ‘pungent’ for ‘powerful’ and we may get nearer the mark. Consider for a moment other pungent white wines which are destined to remain the preserve of aficionados: savagnin blanc or mature viura, for instance. Now, German Riesling is not as pungent as these, but its florality is highly distinctive and assertive (that is its great merit), and hence is unlikely to leave the consumer indifferent. Let me illustrate this from my own experience of selling German Rieslings to private customers in Liverpool (I had no more success with restaurants than anyone else). A hardy group of followers (including several members of the Liverpool wine trade) needed no persuading, but one husband-and-wife couple at my tastings regularly and vociferously denounced German Rieslings as ‘disgusting’ (I finally dropped them off my mailing list). Yet this same couple regularly holidayed in Alsace, where they drank the range of local wines, including Riesling, without a quibble. How is this to be explained? I do not think that the habitual distinction – or polarity – between ‘sweet’ and ‘dry’ quite hits the mark. Although I have only recently become convinced that dry German Rieslings warrant serious attention (the topic of großes Gewächs is for another occasion), in my tastings I mostly showed, because more affordable, Kabinetts and Spätlesen rather than Auslesen: these are wines which on the commonly used scale of sweetness from 1 to 9 would rate between 2/3 and 4 (sometimes 5). Now, wines in the 2/3 range contain as much sugar (though not always tasting as such) as, say, a ripe chardonnay, especially from the New World. The difference surely lies in the higher degree of alcohol in non-rieslings, which acts as a foil to the florality of Riesling, once commonly bottled at 7° to 9° ABV. That is also why, in my view, drier German Rieslings at 10.5° to 12.5° ABV have found acceptance, for the higher alcohol moderates the florality of ‘traditional’ German Riesling without obliterating it. Indeed, many of the new dry German Rieslings are almost as fruity as their lower-alcohol predecessors – without anyone crying ‘sweet’. With Rieslings from other parts of the world the issue barely arises since Rieslings, say, from the Clare or Eden valleys in South Australia have a much more muted fruit character often described as ‘lime’, ‘lemon’, ‘quince’, terms which are not usually equated with florality. Just how shaky these descriptors are is evidenced by wines of the Ruwer and Saar, where the greengage notes often encountered echo ‘lime’ or ‘quince’ rather than more overt florality. There is no doubt that the German Prädikatssystem militates against Kabinetts and Spätesen achieving high scores, and therewith the recognition, they often deserve. As Evan Springarn says, who would give a rating of 97‒100 (on the Parker scale) to any Kabinett? And yet, when the International Wine and Food Society held a lunch at Martin Wishart’s restaurant in Edinburgh earlier this year to present him with its award for excellence, the company began with a 2014 Wehlener Sonnenuhr Kabinett from J J Prüm (8° ABV), to which I would unhesitatingly have given a score of 98. As I’m wholly unprepared for my final exams on Monday, I don’t think it will make much of a difference if I take some time to leave a reply to Tom’s post. Tom: First, thanks for your comment. I agree that German Riesling can be pungent, or even spicy. But I don’t think of it as off-putting. And Mosel Riesling definitely can be described as floral. I do wonder if that Liverpool couple who enjoyed Alsatian Rieslings didn’t care for the sweetness of German Rieslings. Nowadays, many Kabinetts have at least 50-plus grams of residual sugar. I’m not referring, of course, to Kabinett trocken or Kabinett feinherb. Today’s Spätlesen are even sweeter. This would put both of these Prädikat wines higher up the sweetness scale. I agree that a great Kabinett—whether bone-dry or residually sweet—shouldn’t be scored lower than a higher Prädikat wine, and I think more people are interested in Kabinett than ever before. Interesting article, which to me mostly shows that there is no understanding of why some regions become popular whereas others struggle. Much like it is difficult to predict if a song or a movie is going to be a big hit or not. I see the argument of the labels and the German language again, and I start to get allergic to it. Doesn’t the success of Burgundy prove that complicated labeling in a foreign language is not a problem? Is Echezeaux easier to memorize (let alone pronounce) for the American customer than Hermannshoehle? And what is the underlying message, that the German wine producers should give up century-long traditions and their own language just to please the American customer? In a world which is learning to value diversity, typicity and authenticity, this would be a wrong move, certainly a shortsighted one. That’s so true about Burgundy. And one has to know that Échezeaux is grand cru. Correct, Échezeaux is no harder “to memorize (let alone pronounce) for the American customer than Hermannshoehle?” It’s the complications introduced by “Grosses Gewächs” or “VDP.GROSSES GEWÄCHS” that not only begin to weigh-down the name phonically (and “Grosses Gewächs” really does grate on most ears), but more importantly unnecessarily introduce terminology requiring explanation. Thoroughly enjoyed reading Evan’s article and the comments that have ensued. The wealth of knowledge here never ceases to astonish. As much as the historian in me wants to find that link between 19th-century discussions of wine style and the present, i have to assume that the challenges associated with selling German wine at fine restaurants is a modern (post WWII) issue. Ironically, German wine may have peaked in popularity in the 1890s when debates about chaptalization and de-acidification were fresh on consumers’ minds. Despite the proliferation of wine shops and the improvement of restaurant wine lists in my hometown of Atlanta, German wine has hardly seemed to grow in popularity at all. What is the reason for this? From my vantage point, concerns over sweetness, problems with VDP terminology, or unfamiliarity with key brands, seem less relevant than more fundamental matters, particularly cost. As Evan alludes to, consumers are not yet convinced that a bottle of German wine (sweet, dry, or otherwise) merits anything more than $50/bottle on a restaurant wine list. That amount is even lower on a wine-merchant’s shelf. This is unfortunate in an environment where single-vineyard wines in the Kabinett and Spaetlese styles have trended upwards in price. Thus, the small inventory of German wine at my local shop, which has become less interesting over the past few years, now hardly rotates at all. Thanks for your comment, Kevin. It’s depressing to read your assessment of the Atlanta market for German wines, which, despite price increases, are still bargains, as compared with Burgundy and many other regions. This is an interesting article full of important points, but perhaps I’m missing the message. Certainly German Riesling is difficult to sell, and much of it has to do with the articulately-presented aforementioned reasons. (Perhaps the only one that I strongly disagree with is Jancis Robinson’s that the actual flavours of Riesling are intimidating. Perhaps this could be said about the unorthodox wines of the Jura, but my personal experience as both a retailer and a sommelier is that the challenge in fact lies in getting Riesling into people’s glasses, and that once it’s there, only the most obtuse or prejudiced palate can resist its charms). However, the first half of the piece deals with consequences of German wine once it hits the winelist – and they’re all relevant but it seems to me that something very important is being taken for granted. Namely, that pricier Riesling wines (assumedly all wines, then?) are placed on a list and left to their own devices to sell, the likelihood of which is severely hindered by convoluted nomenclature and historical stereotypes. Let’s once more go back to the sommeliers; in stating that “their knowledge and enthusiasm are not the problem,” I can only assume that the problem lies in their incapacity to creatively sell the wines that they so love and respect so dearly. To me, the answer isn’t the presence of more German restaurants and for two reasons. The first has already been thoroughly explicated by David, and the second is that Riesling doesn’t need German food to showcase its countless virtues – it pairs with absolutely everything! While recognizing the inherent challenges, knowledge of and respect for a winestyle isn’t nearly as important as one’s ability to sell the wine. I see this in my own (admittedly, infinitely more modest) city as well – countless retailers, importers and sommeliers who love Riesling but lack either the confidence or competency to improve the world by selling great examples to their customers. Luckily there are also a few who handily manage it, proving that the obstacles can be overcome and perhaps the consequences of German wine languishing on lists (and retail shelves) are really just the results of individuals who think that the wines are worth buying, but not worth the effort of selling. Al, I’m glad that you agree with me about Jancis’s statement. Riesling is just the opposite, in my opinion. There are so many other grape varieties that have a strong or off-putting flavor. Moreover, Riesling truly reflects the terroir and has another dimension. I couldn’t agree more with your opinion that it takes someone passionate about German Rieslings to sell them. Carl and his staff at Craigie on Main would be a great example, as mentioned above. Paul Grieco of Terroir and “Summer of Riesling” has been a tireless ambassador of German Riesling for many years now.